2016 marks the centenary of Harold Wilson’s birth, the fiftieth anniversary of his most emphatic election victory and forty years since his resignation as British Prime Minister. In this new volume, Harold Wilson: The Unprincipled Prime Minister? Reappraising Harold Wilson, editors Andrew S. Crines and Kevin Hickson bring together contributors to reflect on Wilson’s legacy within twentieth-century politics. This book offers a robust counter-narrative to existing appraisals of Wilson’s governments and his influence on British politics, writes Gordon Bannerman. Harold Wilson: The Unprincipled Prime Minister? Reappraising Harold Wilson. Andrew S. Crines and Kevin Hickson (eds). Biteback Publishing. 2016. Harold Wilson won more General Elections than any other British party leader in the twentieth century and served four times as Prime Minister, albeit less than full terms and often with fragile majorities. Wilson served in the great reforming Clement Attlee governments of 1945-51. After succeeding to the Labour leadership in 1963, his Premierships of 1964-70 and 1974-76 were blighted by economic difficulties and marked by Britain’s readjustment to a changing world. By any measure, Wilson was a towering figure in British political life, and his unexpected resignation in 1976 now seems like the end of an era. Wilson’s place in Labour’s history has long been controversial and, by the time of his death in 1995, his influence had been considerably diminished. It is no accident that Wilson’s declining reputation coincided with the dethronement of Keynesian economic theory in 1979 and the paradigm shift in British politics that not only created Thatcherism, but also ultimately drove a wedge between ‘Old’ and New Labour. 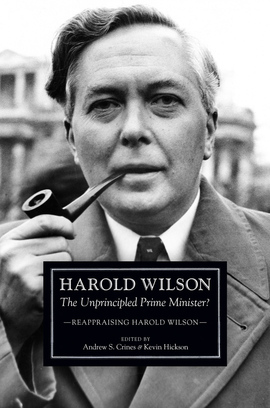 The publication of Andrew S. Crines and Kevin Hickson’s edited volume, Harold Wilson: The Unprincipled Prime Minister? Reappraising Harold Wilson, is an indication that a fundamental reassessment of the Wilson governments has begun. Published to mark the centenary of Wilson’s birth, the volume contains twenty short essays, divided into ‘Themes’, ‘Policies’ and ‘Perspectives’. By blending analysis, narrative and personal recollection, it is an approach that works well. In broad terms, the book aims to rehabilitate the reputations of the 1964-70 and 1974-76 Wilson governments. Leading experts in the field of British politics are joined by former colleagues and admirers past and present, whose appreciative notices provide interesting insights into Wilson the man as well as Wilson the politician. Not the least important of these is the sense that Wilson’s cultivation of the ‘man of the people’ image, with pipe and Gannex raincoat, while it clearly had its political uses, almost certainly reflected genuine modesty and humility. The volume is a timely reminder that, in extremely turbulent times, the Wilson governments achieved rather a lot. While a few essays in the ‘Policies’ section are possibly too short, overall the volume provides an informed view of the scope and nature of Wilson’s achievements and shortcomings. The historiography of the Wilson years tends to be dominated by a grand narrative of dramatic economic, industrial, financial and imperial crises. Despite it being part of the book’s remit to shift the focus away from the grim procession of balance of payments crises, low economic growth and productivity, devaluation, trade union militancy, civil unrest and political instability, those issues inevitably loom large. The contrast between the 1964-70 and 1974-76 governments is well-drawn, with the latter far less dynamic and far more fragmented in its approach to governing. This discrepancy owed something to Labour’s unexpected victories in the two General Elections of 1974, but perhaps more to the experience of the 1964-70 governments, elected on a wave of optimism and high expectations, and described by Wilson himself as marked by ‘disappointment after disappointment’ (32). Often characterised as a Machiavellian political operator, a tactician rather than a strategist, a man who valued power over principle, Wilson skilfully handled a fractious party and minority governments by balancing the different factions within the party. It was a difficult task and he did not always succeed. Intra-party divisions and disputes with Labour’s trade union base hampered reform; most famously, trade union legislation was jettisoned. The continuing retreat from empire, the outbreak of ‘The Troubles’ in Northern Ireland, trade union militancy and, most persistently, the structural problems of the British economy and turmoil in financial markets all contributed to instability. In the process, Wilson’s strategy for economic growth on the back of the scientific and technological revolution was ‘blown off course’ and his credibility tarnished by devaluation in 1967. Most contributors demonstrate that Wilson’s skilful party management was accompanied by a fierce commitment to egalitarianism, an improvement in living standards and, based on recognition of deep-seated social and cultural changes, a desire to promote the economic and ethical modernisation of Britain. An emphasis on these positive and principled attributes informs many essays. In particular, Jeremy Nuttall’s ‘Wilson and Social Change’ is a thoughtful examination of the modernist and traditionalist aspects of Wilson’s persona. Kevin Hickson’s ‘Wilson and British Socialism’ adeptly locates Wilson within the British socialist tradition, harnessing Fabian-type gradualism, ILP ethical socialism and Keynesian doctrines of economic management. Richard Taylor and Jim Tomlinson offer excellent essays on economic policy and industrial relations, wherein Wilson is convincingly portrayed as a corporatist who believed that a mixed economy of nationalised industries and private enterprise was capable of maximising efficiency through State planning and the profit motive. The essays on European integration and devolution demonstrate Wilson’s constitutional conservatism in his attachment to parliamentary sovereignty and the Westminster model of governance, as a related essay by Jasper Miles indicates. As David Moon notes, Wilson mistakenly believed, as did his later successor Tony Blair, that, in Scotland at least, devolved power would curb the growth of nationalism. Like Blair, Wilson was unenthusiastic about devolution. Similarly, Gillian Peele recounts Wilson’s lack of enthusiasm for the European Economic Community (EEC). Wilson was always politically and emotionally more attached to the Commonwealth and Anglo-American relations, and his lukewarm support for – and often outright opposition to – the EEC made the 1975 referendum result confirming British membership something of a pyrrhic victory. Working within the confines of Britain’s parliamentary tradition – famously proclaimed by Ralph Miliband as ‘parliamentary socialism’ – came naturally to a party founded on Liberal rather than Marxian doctrines, and it remained so under Wilson. The institutional bastions of privilege and hierarchy largely remained untouched but, as many contributors argue, there was no ‘betrayal’ of socialism. The reality was that Wilson was true to Labour’s ideological heritage as a constitutionalist social democratic party which, though increasingly technocratic, was never far removed from its origins as a coalition of sectional interest groups. The only way to manage the party, especially when Left/Right divisions were acute, was from the centre. While the compromises and crisis management necessary to achieve party unity led to accusations of a lack of principle, Wilson’s reputation for dishonesty (albeit with some moments of poor political judgment) largely emanated from hostile commentators and from distaste at the politicking demanded by party management. In the aftermath of the ideological hegemony of Thatcherism and New Labour, Wilson’s historical reputation now appears to be on an upward trajectory. Greater appreciation of the reforms he enacted, inspired ‘by a moral vision of political and social change’, combined with greater understanding of the complex and often intractable problems he faced, has wrought a change in historical perception (30). The founding of the Open University, progressive legislation on homosexuality, divorce and abortion and the avoidance of a British commitment in Vietnam have, with time, been shown to have been wise policies that at least off-set some of the economic difficulties which beset his governments. It is suitably left to Kenneth Morgan to summarise Wilson’s legacy, calling for Wilson to be remembered for his humanity and commitment to social justice, with the Wilson governments ‘almost noble’ next to the ‘monetarism, privatisation and dogmatic inequality’ imposed by the Thatcher administrations (309). Less emotively but just as effectively, Crines and Hickson have produced a volume which delivers a robust counter-narrative to the hitherto dominant Thatcherite notions of ‘decline’ associated with the Wilson governments. This challenge to historical orthodoxy makes this book an important one for scholars of British political history and indeed a broader non-academic readership. Dr Gordon Bannerman is a private tutor, researcher, writer and author based in Dundee. He received his PhD from King’s College London in 2005, having previously studied medieval and modern history at the London School of Economics and King’s College London (BA: LSE, 1997; MA: KCL & LSE, 1998). He has previously taught Modern British History at the University of Dundee, King’s College London and the London School of Economics. Read more by Gordon Bannerman.